Restaurant tip pooling has been making industry headlines since it was announced the Trump administration was considering a change to the current law. If the motion to make tip pooling legal passes, tipped restaurant employees may not be allowed to retain all of the money earned from tips. The money would belong to the employer, who could choose to distribute the money to servers, managers, kitchen crew, and even themselves if they see fit. There are plenty of pros and cons to both keeping and repealing the current tip pooling regulations. Let's chat about what they are, define tip pooling, and explore the reaction from the restaurant community to this news. 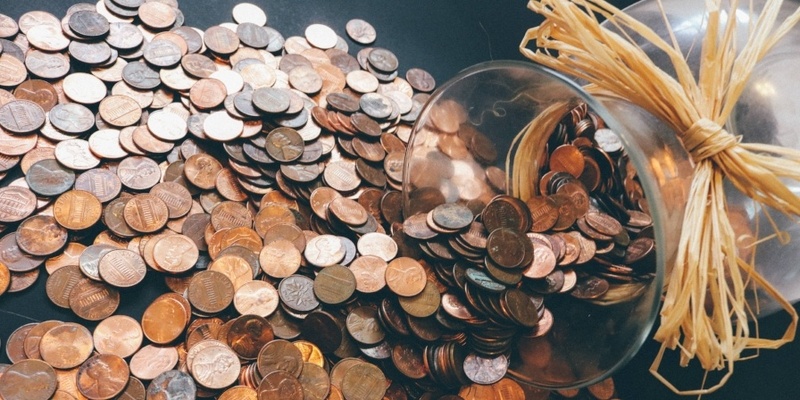 What Exactly is Tip Pooling? Tip pooling is when front-of-house staff shares their tips with each other or back-of-house staff. Under proposed regulations, restaurant owners and managers would effectively take ownership over the tip distribution and could divvy up the tips to those who earn above minimum wage, thus taking the money away from front-of-house workers. In more informal situations, tip pooling can also affect just front-of-house staff. For example, Toast Marketing Manager Julia Beebe recalled a tip pooling experience while serving at a country club in this blog. Servers there all shared their tips regardless of their table or check sizes. Tip pooling is also commonplace in pizzerias, cafés, ice cream places, and fast casual restaurants, where the funds from tip jars are pooled and shared following each shift among the entire staff. Despite a public outcry against this motion, there are some positive points to the idea. We've covered the wage gap between different restaurant teams and the extreme measures that restaurants are going through to bridge it. Service charges, kitchen fees, and banning tipping have all been tried in an effort to solve this problem. Since their role is traditionally non-tipped, back-of-house workers must make at least minimum wage. While some restaurant are able to pay their kitchen staff better wages, many back-of-house workers make minimum wage. Servers, on the other hand, can make significantly more than their back-of-house counterparts thanks to tips. While not a problem in every single restaurant, this wage gap is a significant issue in the hospitality industry. Tip pooling could be a way to bridge the gap between these two groups who are, ultimately, both working towards the same goal – customer satisfaction. Back-of-house wages are static. If a mistake is made in a kitchen or a dish is held up from a long wait time, cooks will still take home the exact same pay that they would if they made every meal with speed and accuracy. On the flip side, if the kitchen is slammed from every table being at capacity, servers reap in all the funds from the full house. Cooks, who had to make all the food, get none of the tip, even though they would have been paid the same for working a slower, less stressful shift. Tip pooling could inspire the back-of-house crew to always be on their A game since their money is dependent on the tip, too. When they know their money is on the line, cooks could put more attention and dedication into what they are cooking. The results? Better tasting food, happier customers, and fewer wrong orders. 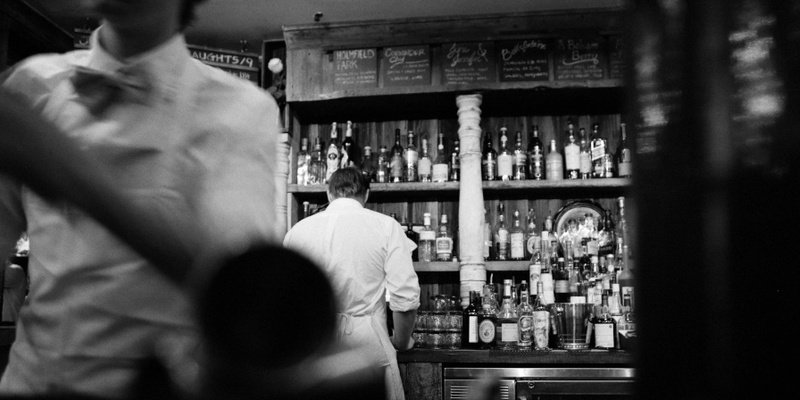 Restaurant owners can worry less about wasted inventory (and spend less on it, too). Granted, this higher profit would come at the expense of tips for servers, but in turn, this could be a way for owners to provide better wages for employees. There are many oppositions both to tip pooling and the regulation proposed. Let's break down a few of them. The way it stands now, tips belong to the front-of-house crew and restaurateurs have no legal claim to the money. This new motion would give ownership of the tips to the restaurant. Owners, in turn, could distribute the funds in any way they see fit – including to themselves, their managers, and their cooks – so long as servers still make actual minimum wage at the end of the day. It's worth mentioning that respectable restaurants probably wouldn't risk losing a great server by taking nearly all of their wages, but this could result in controversy for some restaurateurs to abuse their power. Notably, Mario Batali was sued for wage theft of the very same kind. With this new law, it's predicted that employers could pocket over $5 billion annually from server tips legally. All-star, career restaurant servers have their routine in the bag. They know how to create an incredible and unique experience for every table they tend to. Try telling them they have to give a chunk of their tips to the new server who started a week ago. Try also telling the server who handled a party of twenty over the course of the night to split their tips with the server who rotated between three two-tops. Servers have more than a legal ownership over their tips (at least for now) – there's also a deserved sense of accomplishment. Many take tip pooling as an insult to the effort they put into making that table's dining experience outstanding. Branching off of the previous point, servers make their living not off of the $2.13 tipped minimum wage from employers but instead off of their tips from customers. Knowing they'll earn less per table, employee morale in the front of house could immediately shoot down once new policies are put in place. This negativity and resentment could easily impact the customer experience, leaving your restaurant in a bad place. The common consensus we're gathering from the restaurant community is that tip pooling is a bad idea for the industry. Specific call outs are against perceived wage and tip theft from servers and the employer's ability to control tip distribution to themselves and managers in addition to back-of-house workers. When we brought up the issue to our Facebook page, the comments mostly skewed towards the opposition. People weren't thrilled about chefs making even more money when they already were paid at or above minimum wage. One cook even came to the defense of servers and agreed it was unfair for them to see a wage increase. That said, the other side still had its proponents. One person made this argument. 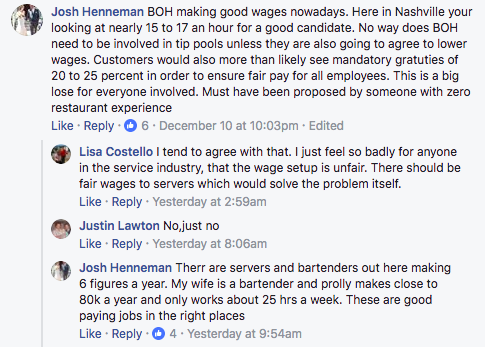 Another commenter, who still opposed the idea, saw that overworked and underpaid BOH staff members do lead to higher turnover, and in an ideal world, this regulation could alleviate that. Average restaurant staff tenure is one month and 26 days, so employee retention is top of mind for many owners. The issue is being also widely covered by publications such as Eater, Fox News, and The Washington Post as well as TV news coverage. This video, created by KTNV Action News, was posted on their Facebook page. We shared it on the Toast Facebook page, where it got dozens of reactions and comments. For a debrief on the current laws as they stand, check out this fact sheet from the Department of Labor. To review the new proposal (and submit public comments for your voice to be heard), visit here. To stay updated on news and trends in the restaurant world, subscribe to the Toast Blog here and participate in the conversation on our Facebook page. To learn how to better manage your staff, front of house and back of house, click below!